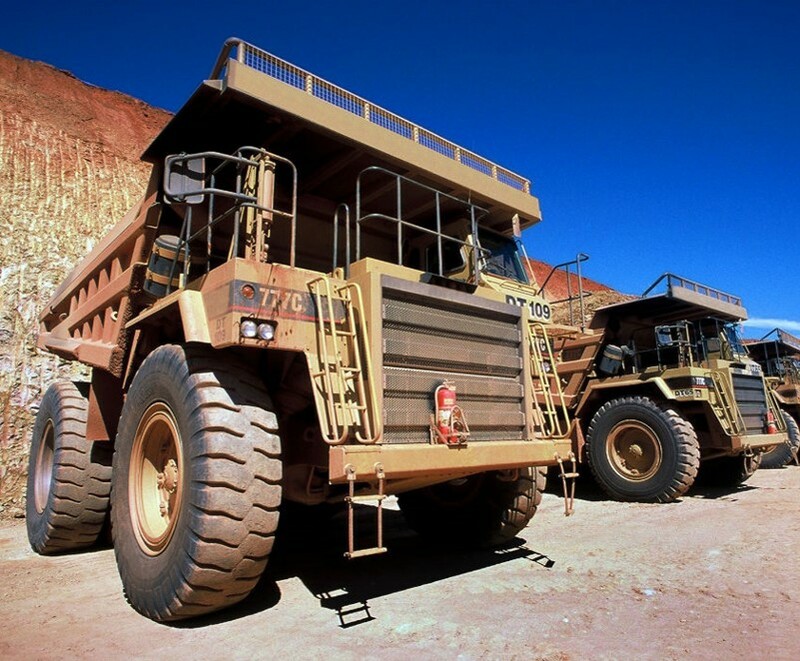 Mining fleets and their managers utilize oil analysis to keep their equipment up and running. From drill and blast to transportation, they need to know their equipment won't fail on them. Some of the largest equipment in the world is created for mining fleets, and keeping them lubricated is of utmost importance. On-site oil analysis can not only keep equipment in check, but lower maintenance costs as well. In the latest addition to the "Ask the Expert" video series, Dan Walsh discusses how on-site oil analysis can decrease maintenance costs, and increase profit. Typical mining processes have five key stages that can either be in one location, or spread out in multiple areas. Those stages are drill and blast, load and haul, process, stockpile, and transport. In the world of mining, there are different types of mining. It can range from strip, also known as open pit, mining which is common for some of the major ores, to underground mining, which is common in different areas of the world. Mines extracting precious metals such as gold, lead, silver, coal, iron, etc. have interest in on-site oil analysis because those metals can show up in the oil itself. Understanding the entire process from drill and blast, to actually getting the ore on the market is very important. Knowing that all in cost, or major KPI, is how mines determine how much profit they are able to make. For example, gold extraction can range from $350 to $700 per oz for the all in cash cost. Reducing the cost of operation is how all mines can increase their profit margins. Maintenance costs are the largest percentage of the entire operation costs. For open pit mining, 45% to 60% of the operation cost is purely maintenance cost due to it being heavily intensive with capital equipment. Underground mining is typically less than 35% because the product and equipment is different. Smelters and other first processes can be between 25% to 30%. Any effort to reduce the cost of maintenance increases overall profit. On-site oil analysis is very attractive to mining operations for that exact purpose. Mining maintenance personnel will use all four maintenance strategies when they approach their maintenance cost. In most cases they will try to strike an optimal balance between the time it takes and the cost of disruption to reduce time lost due to breakdowns, and cost of maintenance, while increasing up time. Asset utilization, mean time between failure, and cost per horse power per hour, are all important KPI's for mining managers to be aware of. Any time an oil analysis solution is brought on-site, managers have a way of directly affecting those KPI's by lowering them and essentially raising the profit margins of the operation. The image below shows the type of equipment seen at each stage of the mining process- drill and blast, load and haul, and final process, the moving parts within that equipment, and the tests that should be run for each stage. Because most of the equipment has similar moving parts, such as hydraulics and transmissions, the main set of tests are similar for all three stages of the typical mining operation. TBN, particle count, oxidation, water introgression, dirt and processed material dust, are all important metrics used to monitor equipment health in every stage of the process. The Microlab 40 is the ideal solution to run the recommended tests for a typical mining operation in less than 10 minutes. It is easy to use, so there is no need for a technician to operate it. It provides an easy-to-read report of the test results, along with the suggested maintenance actions that should be taken to correct any abnormalities found in the equipment. The MicroLab 40 truly is the ideal solution for mining fleets and their managers. In specific cases where exotic fluids (PAG) and lubricants are required, the MiniLab 153 also may be considered. 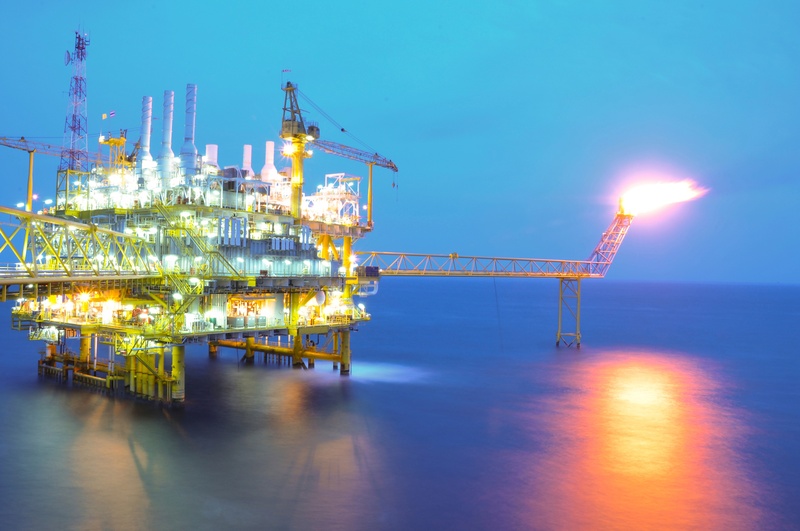 Oil and gas exploration companies have been using oil analysis for many years to lower maintenance costs, predict and prevent equipment failures, and increase uptime for drill rigs, both on land and at sea. The often remote location of such rigs and inaccessibility to commercial oil analysis laboratories make them perfect candidates for on-site oil analysis. In this edition of Ask the Expert, Dan Walsh discusses the need for on-site oil analysis and many of the benefits for exploration companies. Oil and gas rigs are pretty similar whether they are land or sea based. In each case they typically have a drill platform used to drill into the ground below to extract the buried oil or gas. The drill platform is powered by a central power plant usually comprised of one or more diesel gensets and/or AC generators. In addition to a central power plant, drill rigs have numerous gearboxes, rotary drives, hydraulics, mud pumps, clutches, torque converters and other rotating equipment lubricated with oil and grease. Sea based rigs have the same equipment for drilling plus additional equipment to provide propulsion. This is typically separate from the drilling power plant. Older rigs often have mechanical, direct-drive systems linking the power plant to the drilling unit. Newer rigs commonly use AC or SCR systems that provide more control over the speed of the drilling. It is estimated that there are between 10,000 and 20,000 rigs in operation now worldwide. On average these rigs need the price of a barrel of oil to be >$55 in order to profitably produce oil. Some operations, like those in Saudi Arabia, have a lower break-even point. Unlike fixed factories, oil rigs are typically mobile and can move often to new oil fields either on land or sea. As such the logistics of sending samples to commercial laboratories can get difficult and often, impossible. This is one reason why on-site oil analysis is a great solution for oil and gas exploration companies. Turnover of personnel - personnel, particularly on off-shore rigs, often rotate in and out after a few weeks. Having easy to use oil analysis equipment with clear reporting and recommended maintenance actions simplifies the process for all. Time for oil drain intervals - it can be quite expensive getting supplies of new oil to remote locations and disposing of used oil properly. Anything to reduce oil usage saves money. Cost of disrupting production - replacement parts are often hard to come by. Being able to plan shutdowns and have the proper parts available improves production. One of the nice things about having your own, on-site oil analysis is that it allows you gather copious amounts of data on your equipment, lubricants and maintenance practices. Having this information enables better decision making. The image below shows the three categories of equipment that are typically monitored - Engines, Rotating Equipment and Hydraulics, and what tests are important for each category. The image outlines the main concerns with each type of equipment and which specific tests are recommended. For instance, only engines are burning fuel and being cooled by glycol, so engine testing would involve testing for fuel dilution, soot, glycol in addition to several other parameters, such as viscosity, wear elements, TBN and nitration. This MicroLab Series is well-suited to performing these tests in a matter of 10 minutes. 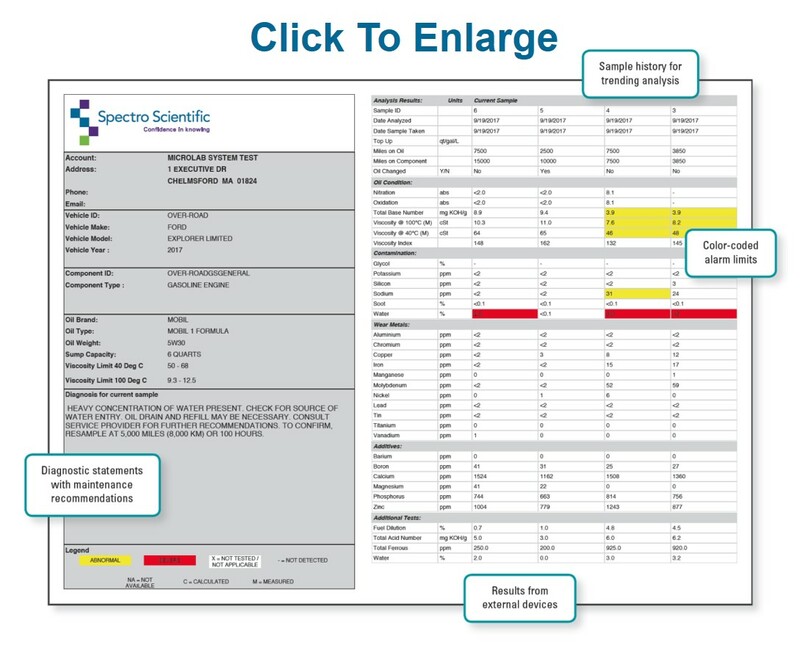 The MicroLab is simple to use and produces a detailed oil analysis report with clear, actionable, maintenance recommendations. The MicroLab 43 includes the CoolCheck 2 for measuring coolant, the FDM 6000 for fuel dilution and the FerroCheck 2000 for measuring ferrous wear. This is really the ideal choice for taking care of all the equipment found on drill rigs. Historically rail fleets were one of the first users of oil analysis for reliability. 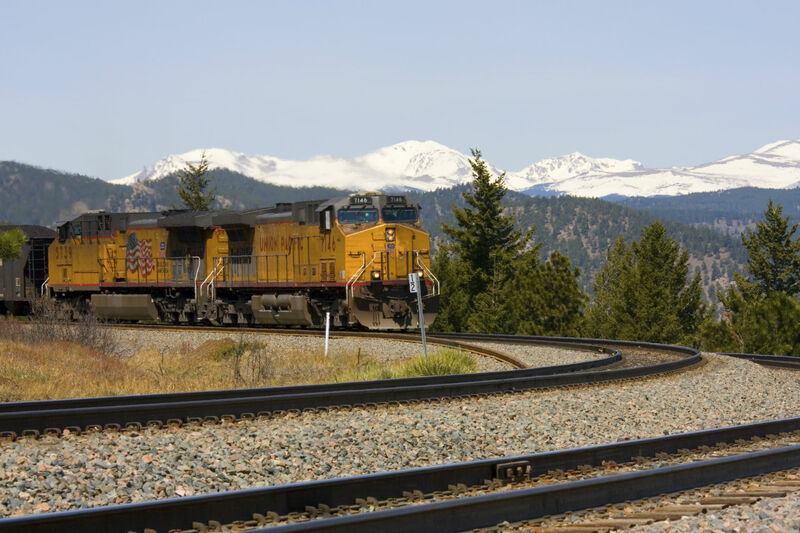 Oil analysis for predictive monitoring was first used by the US railroad industry to monitor the health of locomotives. In 1946 the Denver and Rio Grande Railroad's research laboratory successfully detected diesel engine problems through wear metal analysis of used oils. This practice continues to this day. Transmissions are very complex systems for converting and directing power from an engine to a drive train or other end use. 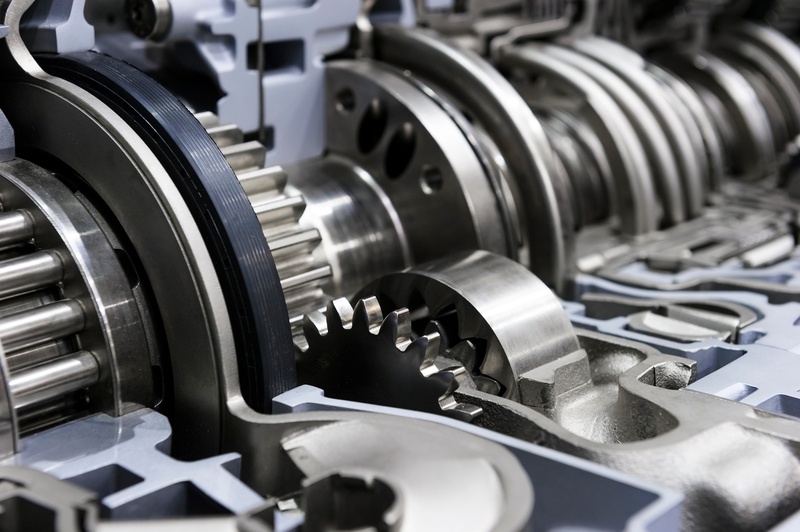 Transmissions are typically found on mobile equipment and consist not only of gear sets, but also brake and clutch sets, torque converters and valves. Mobile transmissions are typically broken down into two categories - highway and off highway. Off highway consists of mining equipment, heavy-duty construction equipment, agricultural equipment and other mobile equipment typically used somewhere other than on a paved road. We have worked with many fleets to bring oil analysis capability on site with the MicroLab® analyzer. The programs can be very successful in helping fleets save money by extending oil drain intervals and by identifying mechanical issues before they result in catastrophic failures. The MicroLab® produces a comprehensive oil analysis report in less than 15 minutes to provide a complete picture of oil and machine condition, which allows a technician to make real-time maintenance decisions while the equipment is still in the garage. 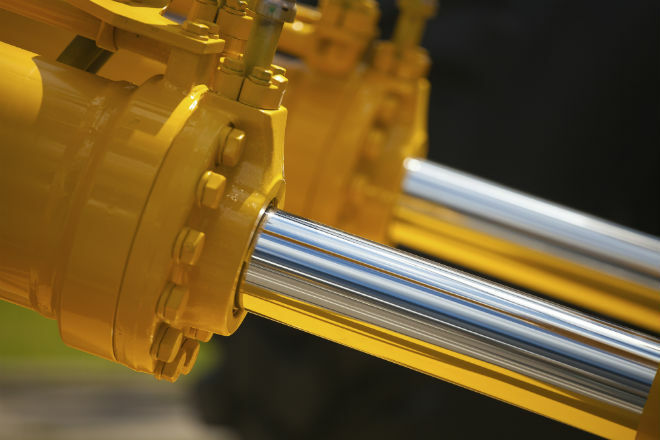 Pumps are used in industrial and fleet applications to move liquids and gases. 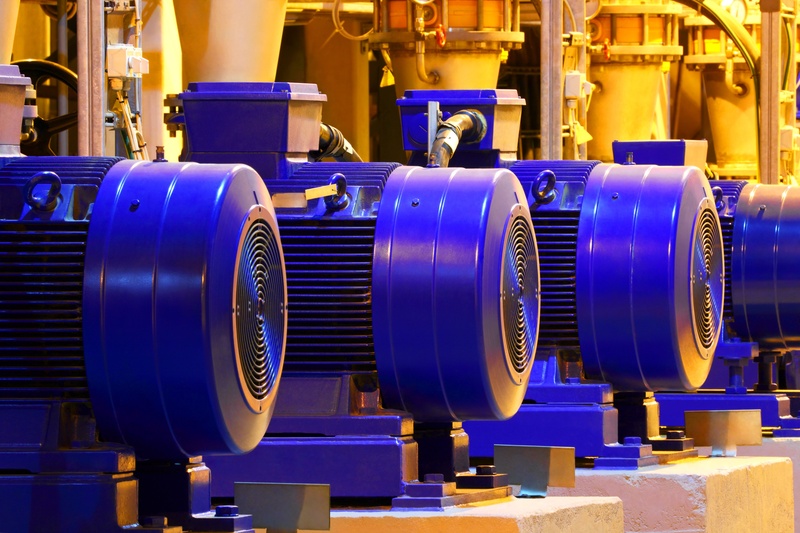 Most pumps used in industrial applications are either positive displacement or centrifugal. In both cases bearings are the component that must be lubricated and monitored. Rotary positive displacement pumps have gears, screws, lobes or vanes which are also lubricated, usually by the fluid they are pumping, whether it is a lubricant or an oil /air mix. 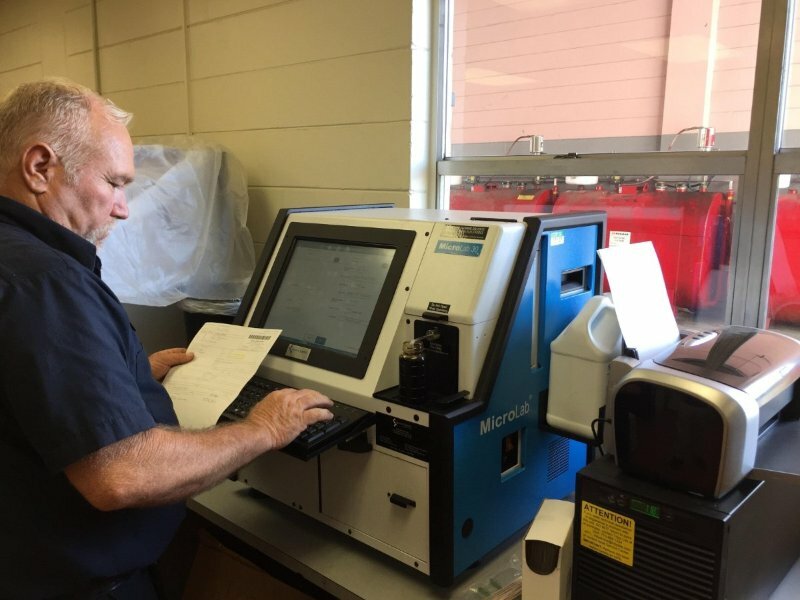 When companies are considering adding on-site oil analysis capability to their maintenance program with the MicroLab analyzer they typically want to know how quickly the investment will pay off for them. 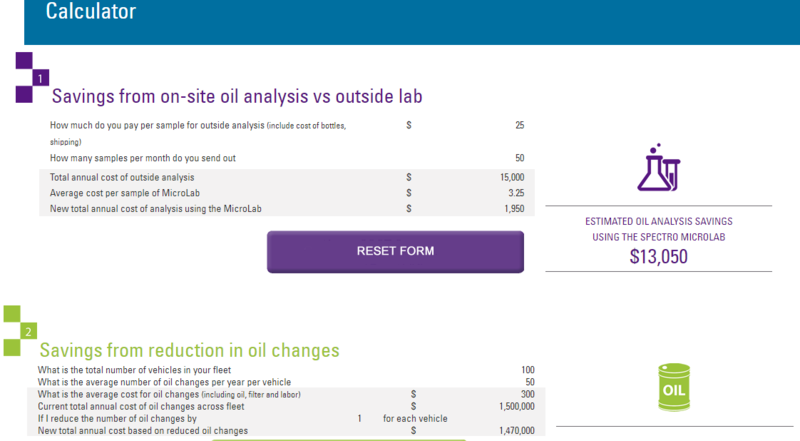 To help fleets evaluate the potential savings that on-site oil analysis can bring to them we developed a savings calculator that allows you to input specific information about your fleet to determine the estimated annual savings you may achieve. The calculator considers three areas of savings potential. Hydraulic systems are used in industrial, mobile and aviation applications to transmit power to operate equipment. They are incredibly efficient, compact, and lightweight relative to a mechanical equivalent. Hydraulic fluids transmit force in the system, and as such are carefully chosen by the system maker. Chemical stability, high flash and fire points, viscosity, and oxidation resistance are all valued, and as a result mineral and synthetic hydrocarbon fluids are selected for mobile and industrial systems, whereas functional chemicals such as phosphate esters are chosen for aviation and specialized industrial applications. Oil analysis was first employed on engines as a predictive maintenance tool, and it remains a predominant technique for insuring the reliability of engine systems. Reciprocating internal combustion engines power most of the world's mobile equipment, such as cars, trucks, buses, locomotives, mining equipment, agricultural equipment and are also common in stationary backup power generators, oil and gas exploration rigs, and pipeline compression stations.